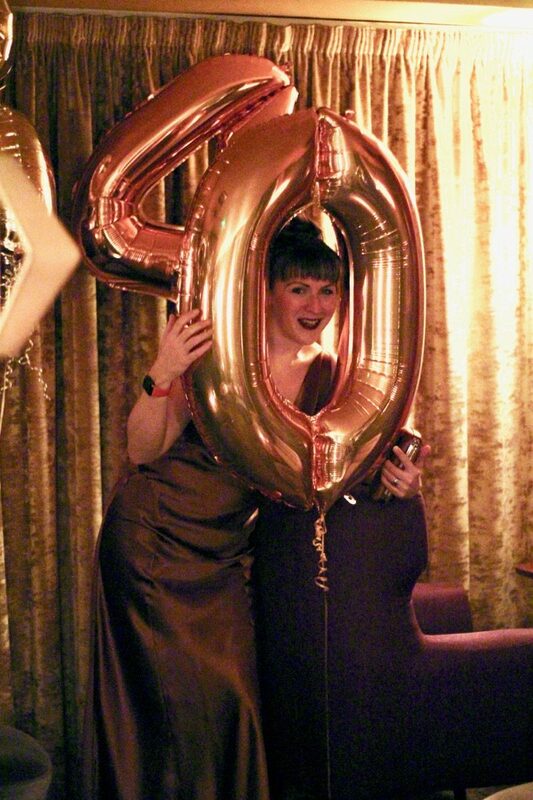 Happy 40th birthday to me! Since it's a big birthday year I kinda felt like I just had to celebrate big, too! So we rented the whole of a private members cocktail bar near Kings Cross, invited a bunch of people, laid on pizzas, and let the rest just happen! 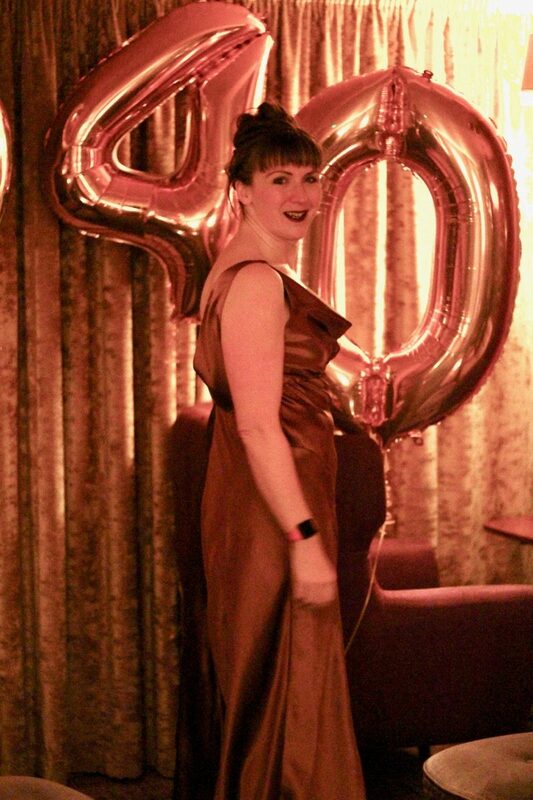 Every year I like to make myself something special to celebrate my birthday, and I felt like I should sew a big, glamorous dress for myself to feel like a total star at the party, too. 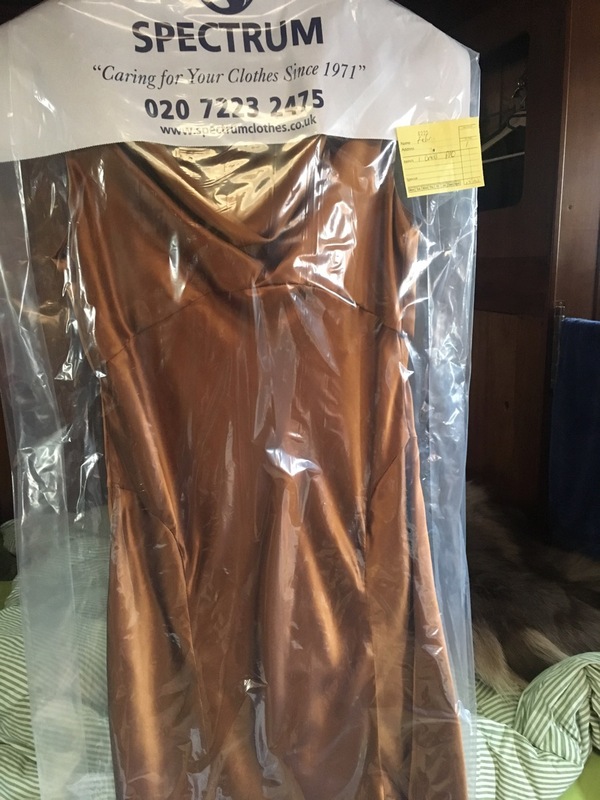 I happened to have four meters of gorgeous copper-coloured silk satin (charmeuse) in my stash which I'd bought from Truro Fabrics back in 2015 with the intention of sewing a gown for the World Transplant Games gala dinner in Argentina. But I didn't quite have enough time to sew it before we left, and the silk has been in my stash ever since. I still had the receipt in with the fabric, too, and the price reflects the incredible quality of this silk - I'd paid about £75 for it. I’ve had Vogue 2965 in my stash for even longer, if you can believe it! I bought it in 2007 or 2008 when I was auditioning pattern for my wedding gown, but when my Granny gave me her gown to refashion into mine, this pattern didn’t really work with the refashioning as it requires some huge skirt pieces cut on the bias. 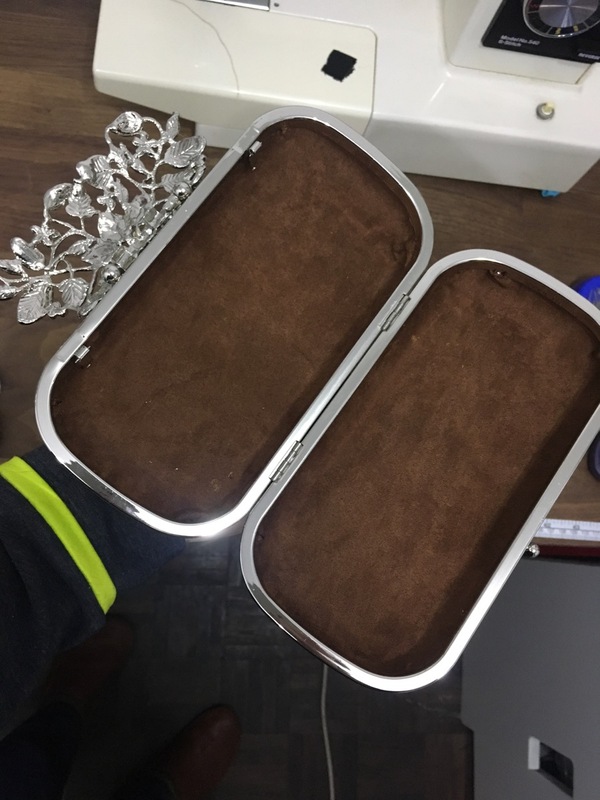 So the pattern has been in my stash ever since, and I thought this could be the perfect opportunity to use both! 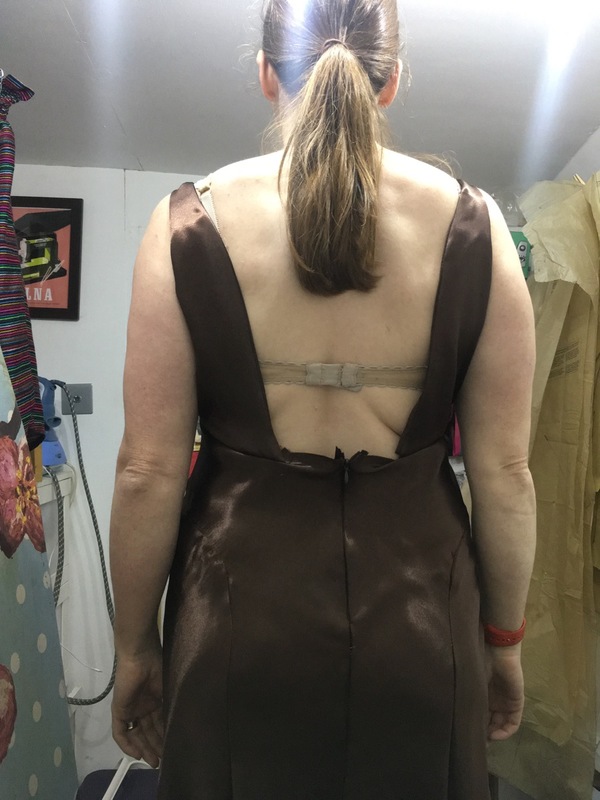 A dress this special really needed a muslin, though, so I bought some really cheap and nasty polyester satin in a similar brown shade for £2/m to help me check the fit, style, and drape as well as give me a practice run of the techniques in the pattern. 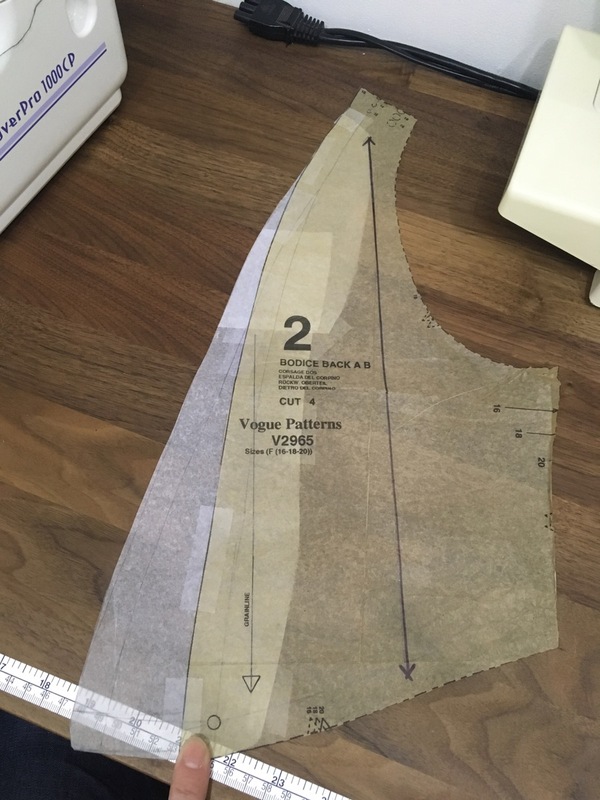 The gown itself is cut entirely on the bias, apart from the bodice back pieces, which are cut on the straight grain. Because those long skirt pieces are on the bias, you really need a lot of cutting table space, which I don’t have at the moment. So I took my pieces into my office and made use of the boardroom table after work! I did get a lot of people stopping by asking what I was up to! I was really pleasantly surprised with the fit of the muslin. I was afraid that there’d be tons of ease since it’s a Big Four pattern, but I found this one fit pretty true-to-size, with the skirt being close fitting around the hips, but not skin tight and I’ve got plenty of room to sit down comfortably in it, too. The one thing I really didn’t like about the muslin, though, is that the back pieces didn’t meet in the centre back – this is by design, and there’s a gap of about 4-5 inches there which meant I had an unfortunate lack of coverage in the sides of my lower back and you could see my fat rolls, ugh!! Luckily, though, it was a really easy one to fix as it only meant extending the bodice back piece to meet at the centre back point, which also meant I didn’t have any issues finishing the upper portion of the skirt in the back (the pattern calls for it to be joined to the lining and finished off with it there). 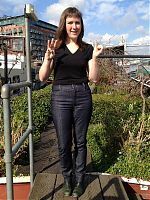 The bodice is self-lined, and the pattern calls for you to line the skirt and sew them as one to the bodice at the empire waist seam, but I didn’t have anything suitable and thought it’d be fine unlined (it was!). With the muslin out of the way, I could actually cut into my silk after four years! So it was back to the boardroom table for me, and then I could finally get started on sewing it. 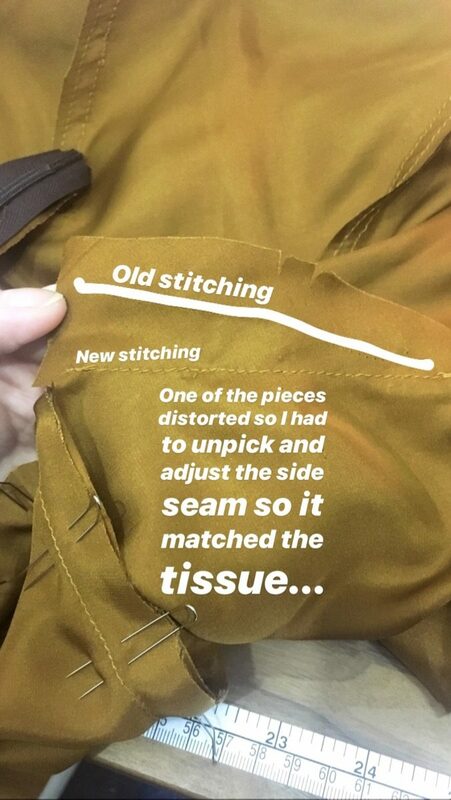 Unfortunately I also caught a really nasty head cold and chest infection combo which kept me home sick for most of the three weeks before my birthday, and too weak to sew more than a seam or two at a time before having to go lie down. 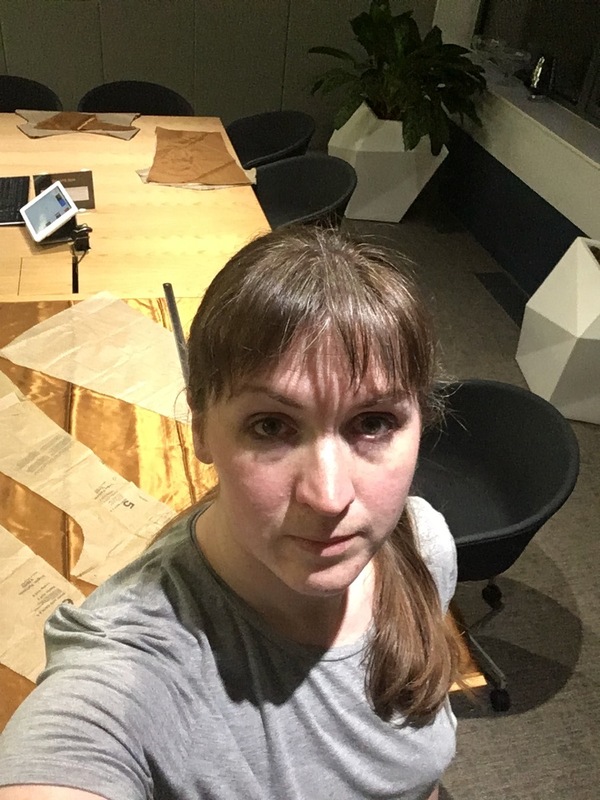 But the construction of the dress itself was very straightforward – there actually aren’t that many seams and I was pleasantly surprised at how nicely those long bias skirt seams ended up. One thing that really helped the construction here were the Clover fork pins I’d picked up a few years ago. 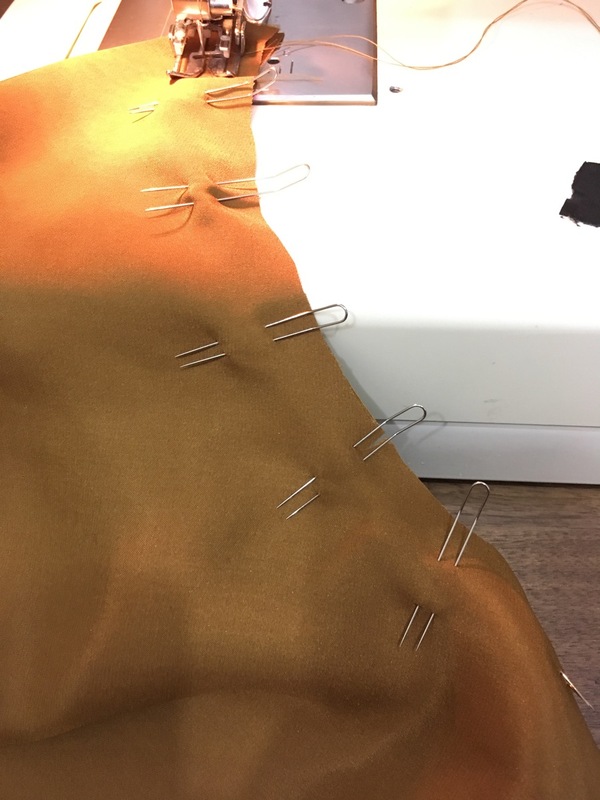 These are like two pins joined at the head and are utterly brilliant for fine, slippery fabrics like this as they really keep the fabric in place, are thin enough to easily sew over them, and don’t fall out like my normal glass headed pins kept doing in the few places I used them. 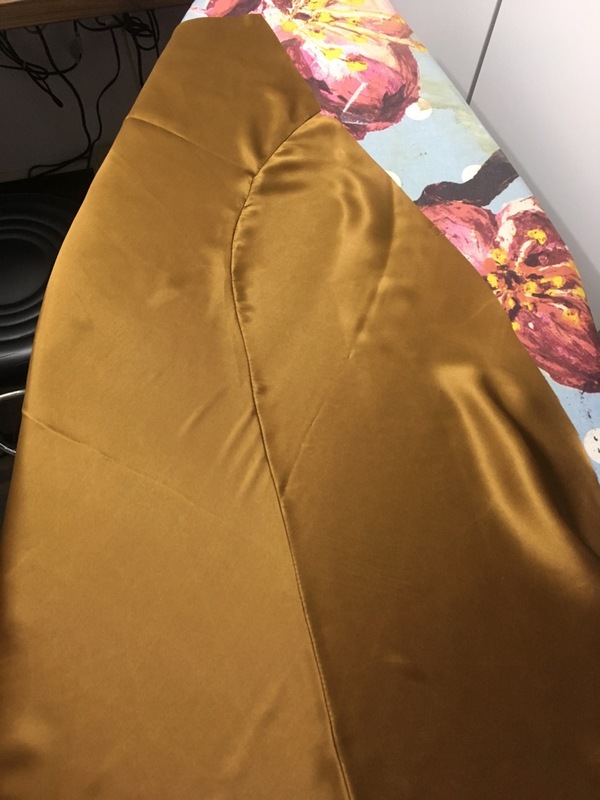 The curved hip seams were a little tricky since there’s a lot of easing to do and Vogue didn’t really make this any easier by only having one or two matchpoints in the curved area. More notches makes it much easier to match curved seams like this! 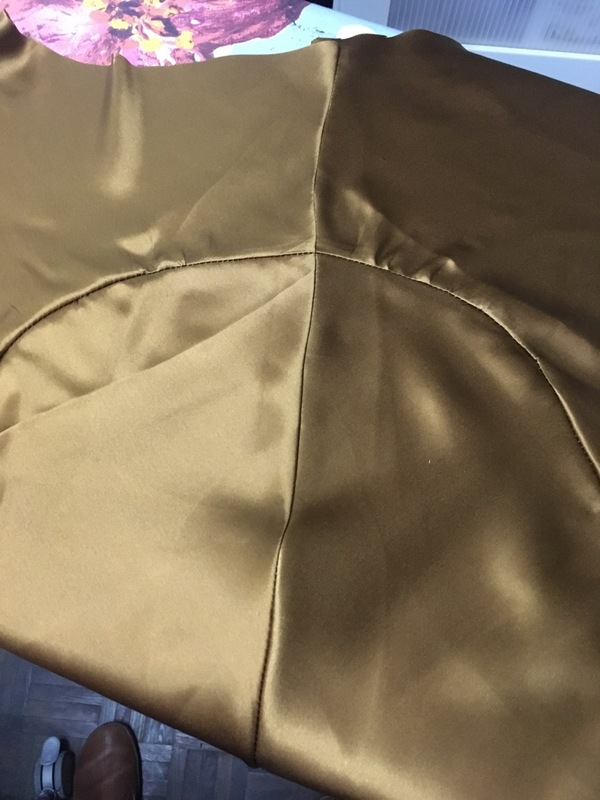 The fork pins also came in handy when it came to sewing the side seams and getting those curved seam intersections to match up perfectly! I actually only had one piece distort which is incredible seeing as how this fabric was like sewing water! 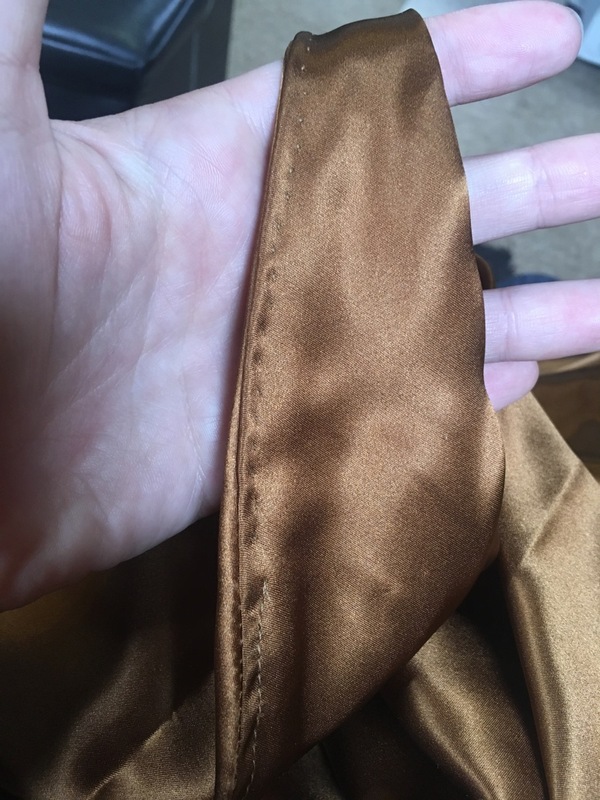 I discovered when I went to join the skirt to the bodice that one of my skirt pieces had grown a little and didn’t match up, so I unpicked the top few inches of the side seam, marked where the seam should be against the tissue, and resewed that seam in the correct place. But I think that’s the only bit of unpicking I did in the whole dress! 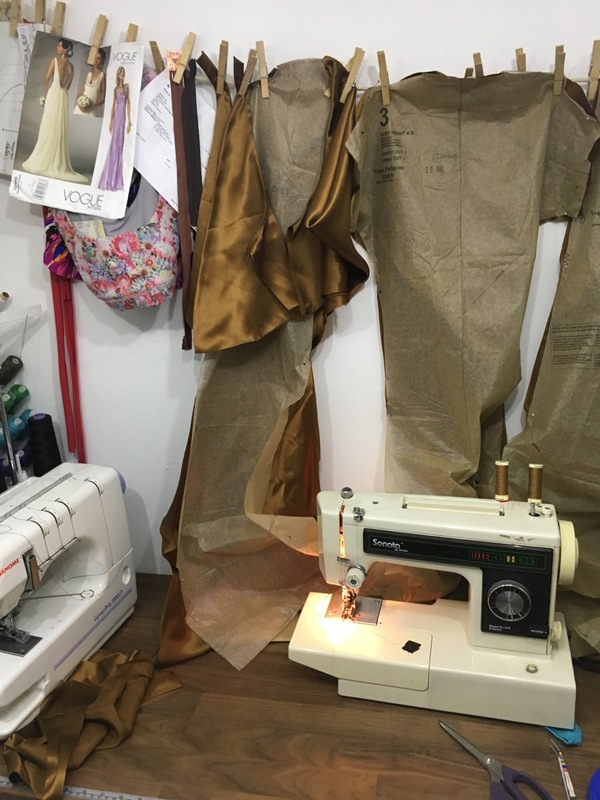 As you should always do with bias skirts and dresses, I let my gown hang for 24 hours to let the fabric grow, but thankfully I still had enough length to reach the floor even after I’d evened out the hem. 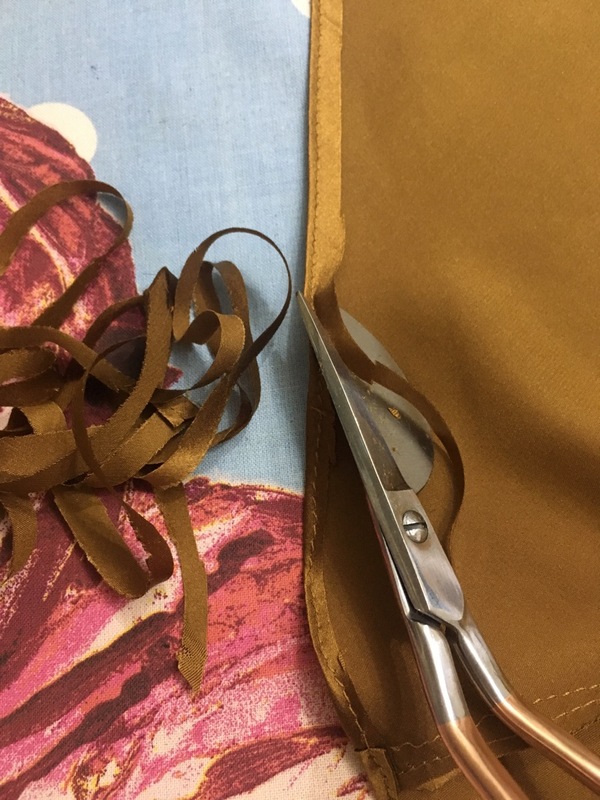 I hemmed this with my favourite narrow edge method – Press about a quarter inch, edge stitch, trim the hem very close to the stitching, then press under again and stitch from the right side. My Prym duck bill scissors made the trimming much easier (and less fraught with danger!) than with regular scissors. Since I’ve had a lot of sick time, I also took the opportunity to do some nice hand sewing touches. 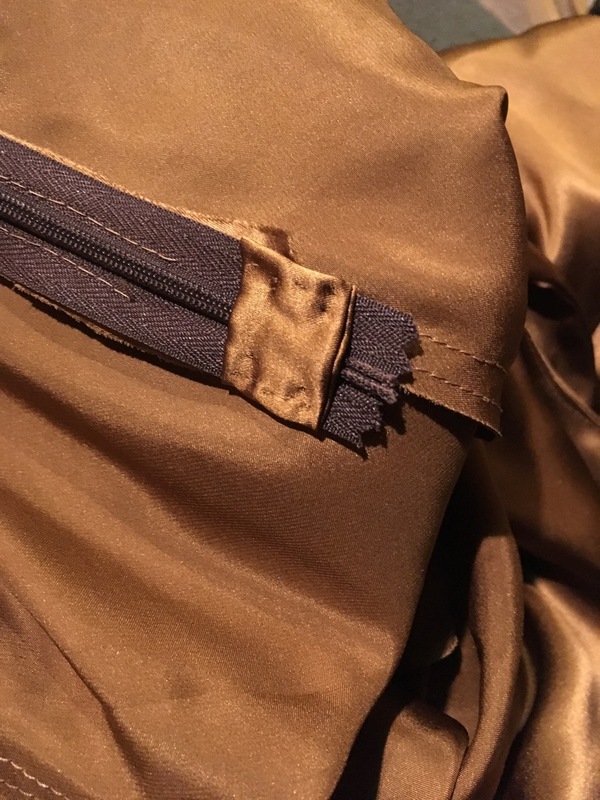 I covered the scratchy bit of the invisible zip to prevent my tights from being snagged, and I went back to the edges of the bodice that were impossible to understitch fully and prickstitched the lining to the seam allowances inside. I don’t know why, but I absolutely love prickstitching, and I really don’t enjoy most hand sewing! 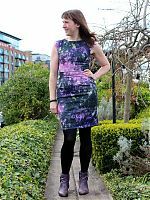 The last step in making this dress was something I’d never done before – I took it to be professionally pressed at my local dry cleaners. 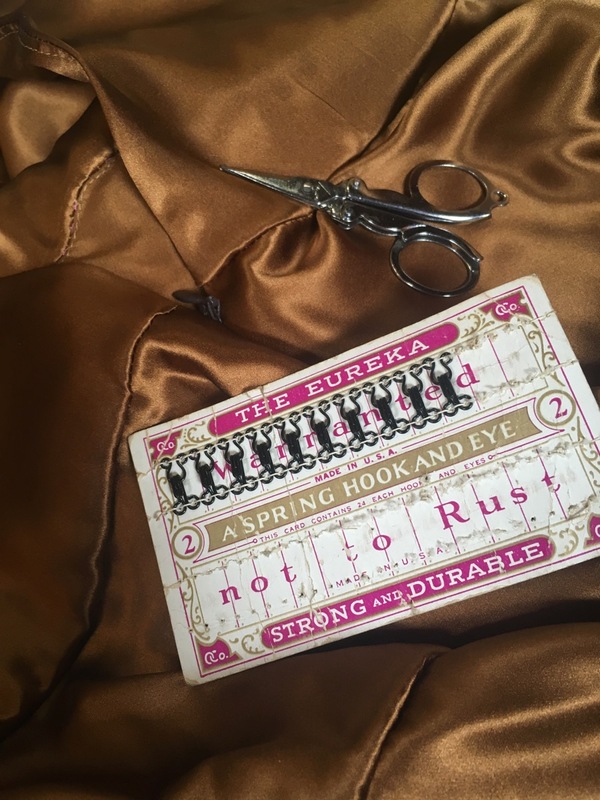 The silk had a definite grid pattern of creases from being folded for four years, and my domestic iron just couldn’t shift them (it just made it incredibly staticky!). I brought a piece of scrap fabric to test against their press, and it worked like magic. 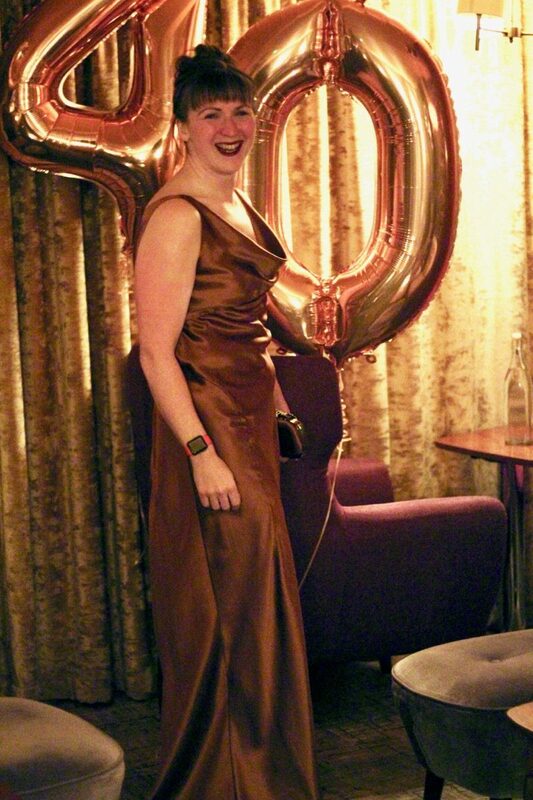 It may have cost me £15, but it was SO worth it to have all of the creases out and looking like a million bucks for the party. 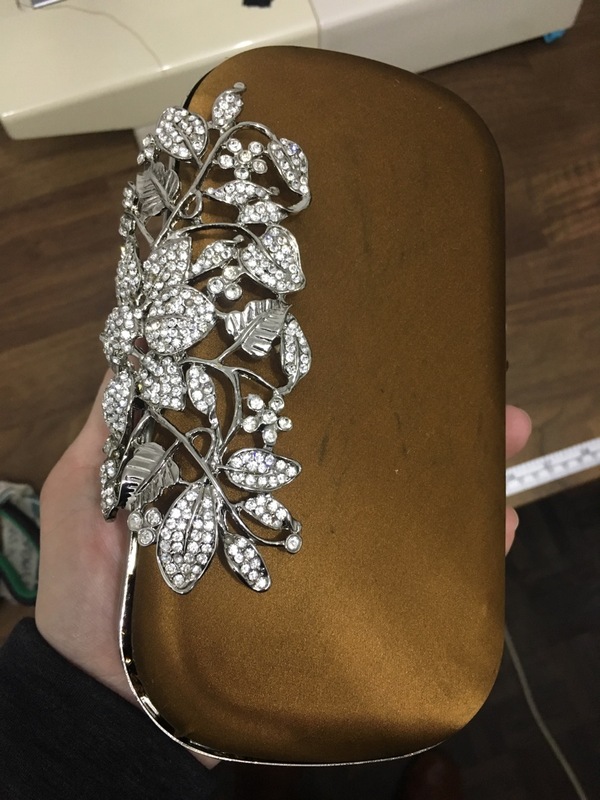 And if the gown wasn’t enough, I realised that I had a really bling clutch form in my stash that I’d bought from U-handbag when Lisa sold the business and was clearing out stock. 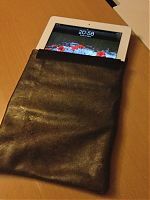 People are always SO impressed when I make a matching clutch but it’s almost embarrassing how easy these are to make. 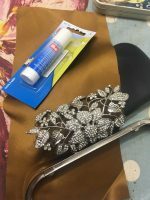 You literally just glue fabric to the outside and inside of each of the plastic shells (I like Prym’s glue stick), trim the fabric, then glue inside the trough of the metal form and along the edges of both plastic shells, and stick them together. Done! So I had a lovely bag that matched my dress, too. 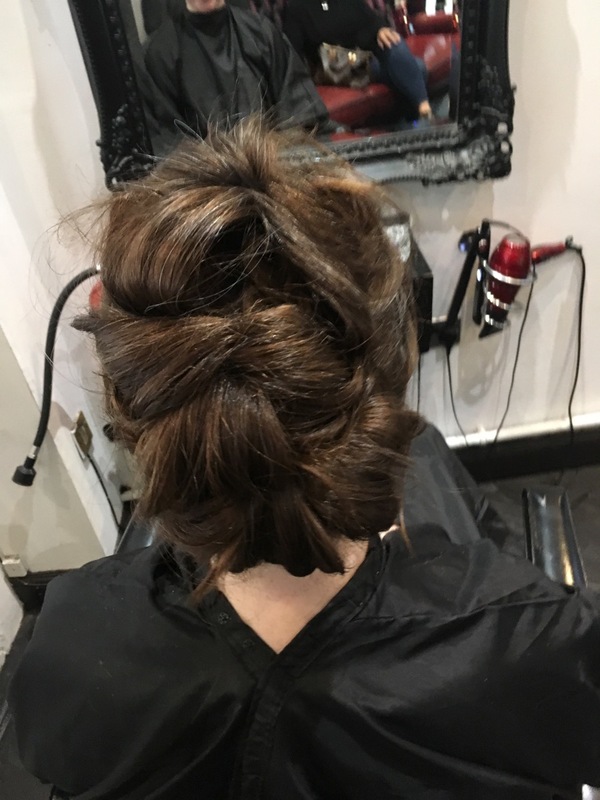 I also really needed a haircut so I booked it for earlier in the day so my stylist could give me a fun updo for the party, too. 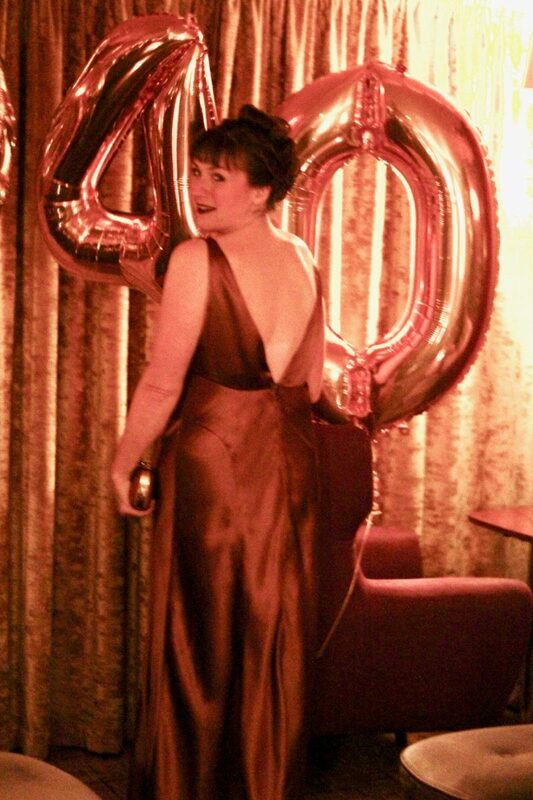 I really did want to feel glamorous at my party, and it worked! 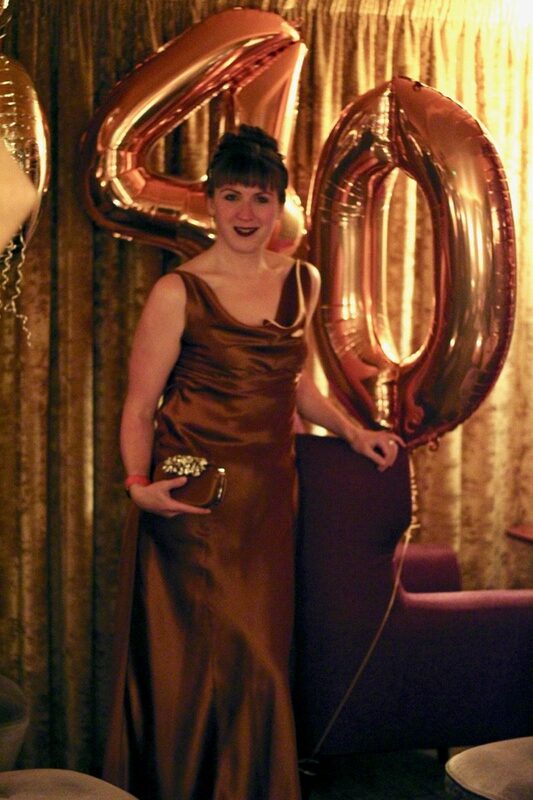 Bit of a fancy gown, fancy hair, and some makeup and I was practically a movie star! Even though we brought the big DSLR camera, the lighting was very low in the cocktail bar and there wasn’t enough room to get the full hem in with the low-light lens James was using, so you’ll have to forgive that the colour is a little off! I was having far too much fun to look at my phone let alone take any candid photos throughout the night! 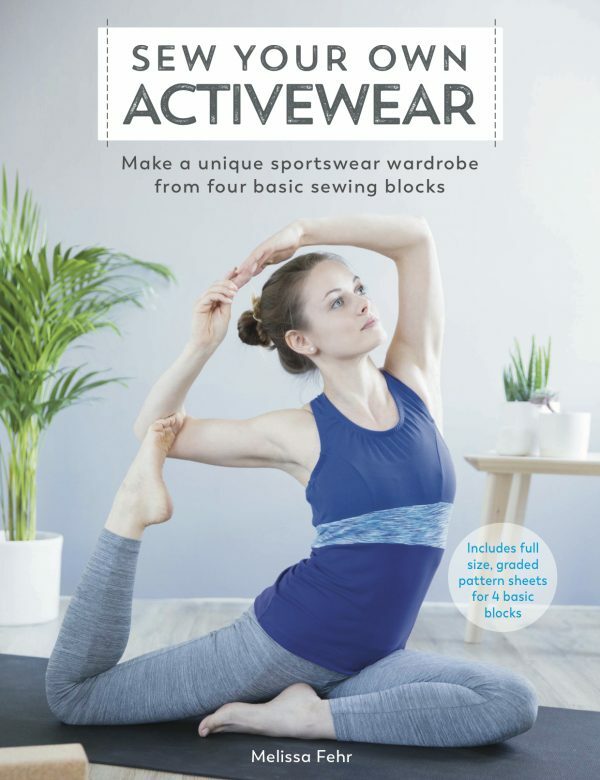 39th – I sewed myself a long sleeved cycling top though really I spent the day moving into our temporary flat while the boat was being renovated. 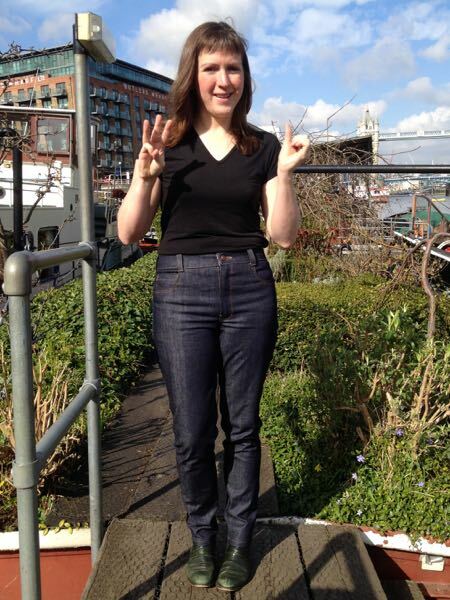 38th – I made a Gimlet dress out of some incredible, embroidered ombre denim with flashes of the red satin lining. 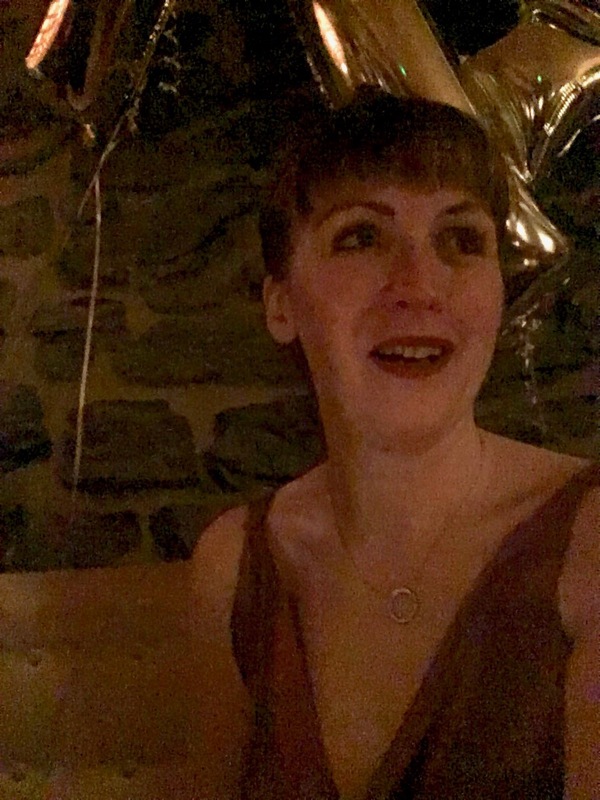 37th – This birthday sucked. I’d been continuously ill for three months, we spent six hours stuck in traffic and got turned away from the restaurant (no bookings). I couldn’t even summon the enthusiasm to post about it, let alone make anything. 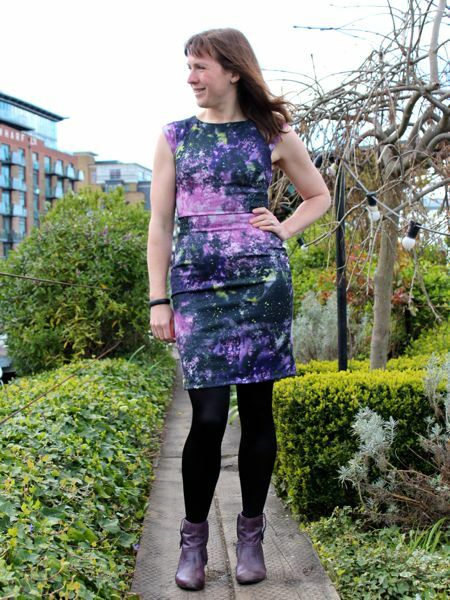 35th – A galaxy-print sheath dress, using a Manequim pattern and a purple exposed zipper. 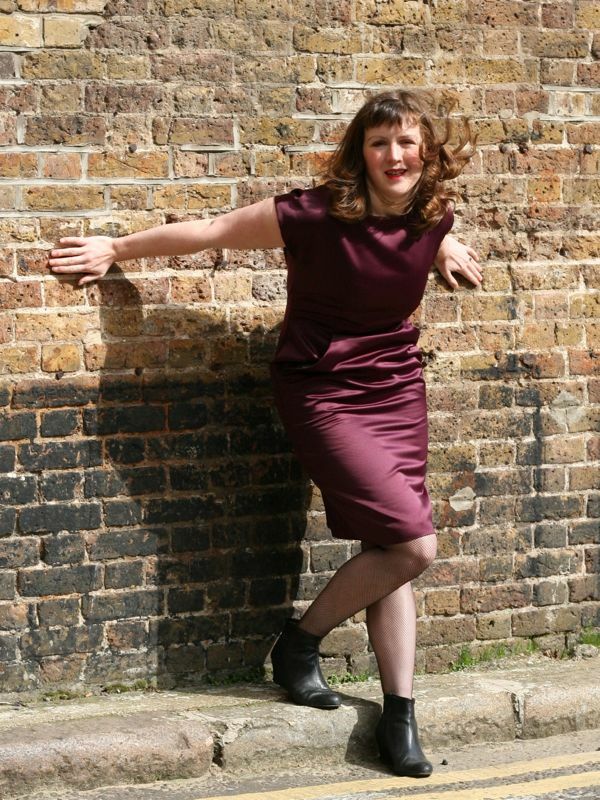 34th – A satin Matthew Williamson designer dress, made with his pattern from BurdaStyle magazine and a rich, plum duchesse satin. 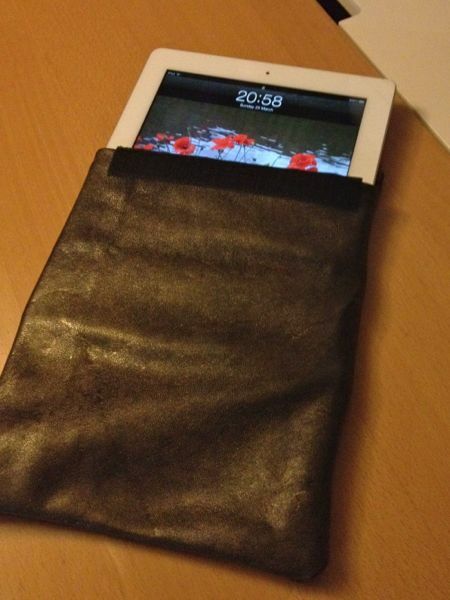 33rd – A leather iPad case, protecting a new gift against the rigours of a transatlantic work trip the following day. 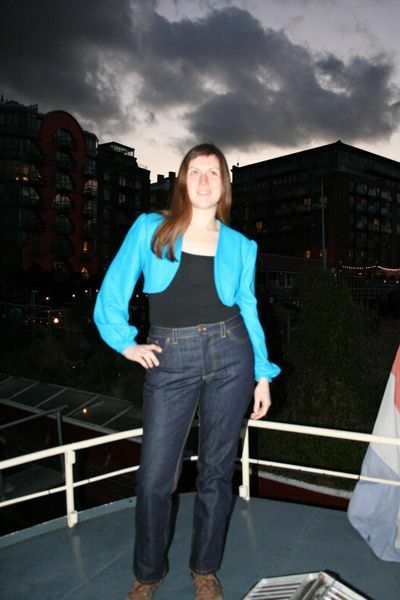 32nd – Manequim silk blouse: still being worn and loved many years later! 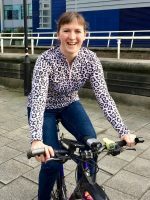 28th – I was homeless and living out of a suitcase in my boyfriend’s parents’ house, watching the Shipping Forecast every single day, hoping for good weather to sail our boat across the North Sea. 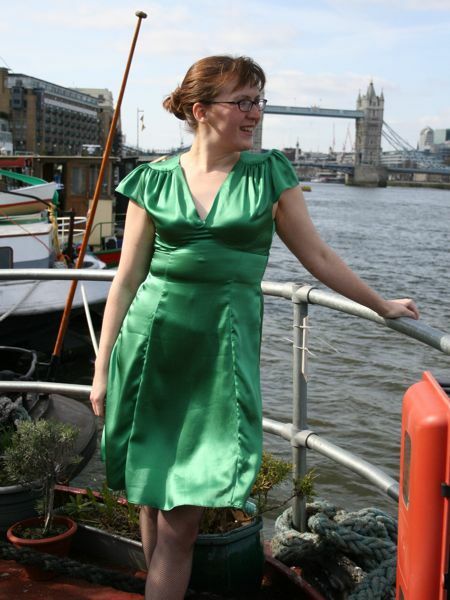 My sewing machine was in storage, so I couldn’t make a new outfit, and frankly, ALL I wanted was for our boat to arrive. And it did, on the evening of my birthday. 27th – New Look 6429 in a fun sparkly knit from Walthamstow Market (and then about three days later decided to lose all that excess weight for good!). 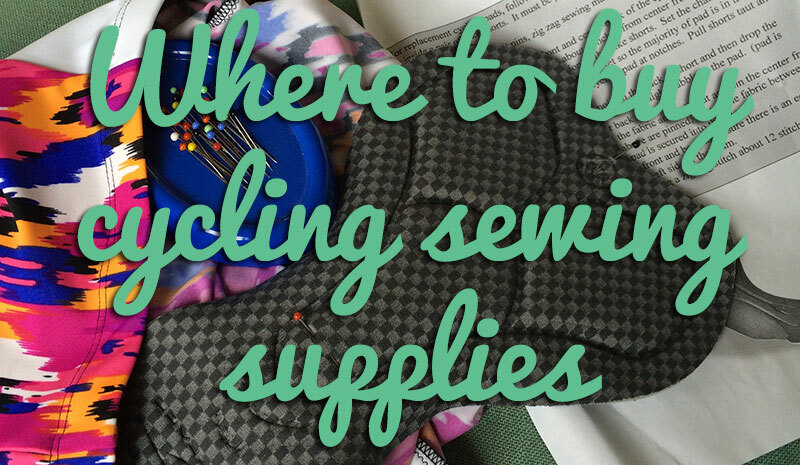 Does anyone else share the same birthday sewing tradition? 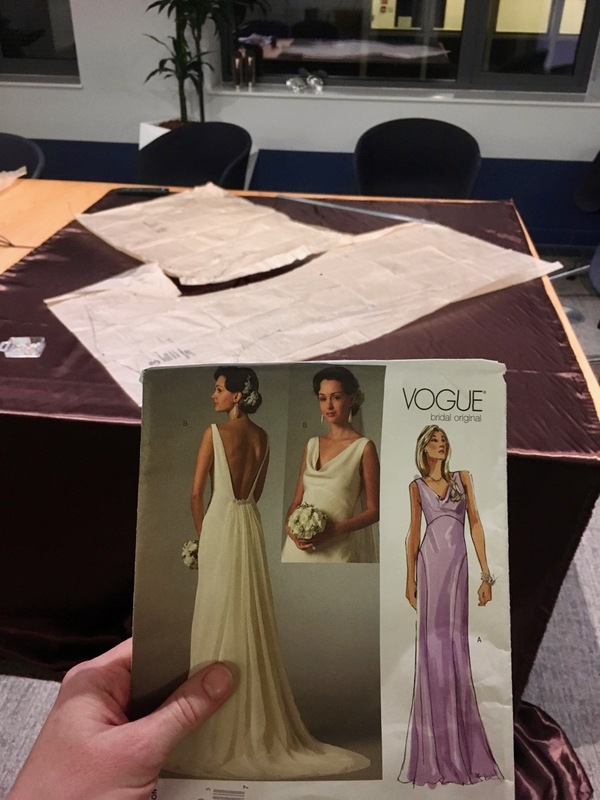 Separator image Posted in Gallery and tagged with dress, silk, vogue. Happy Birthday! That gown is magnificent! aww that’s very kind, thanks. Happy Birthday! You look suitably fabulous in your dress. you look fantastic, that dress is so beautiful – you can’t beat Vogue patterns if you want a gown or some drama. Lovely color on you and your undo is perfection. Happy Birthday!!! Happy Belated Birthday !! You did a WONDERFUL job on your dress and look absolutely BEAUTIFUL! 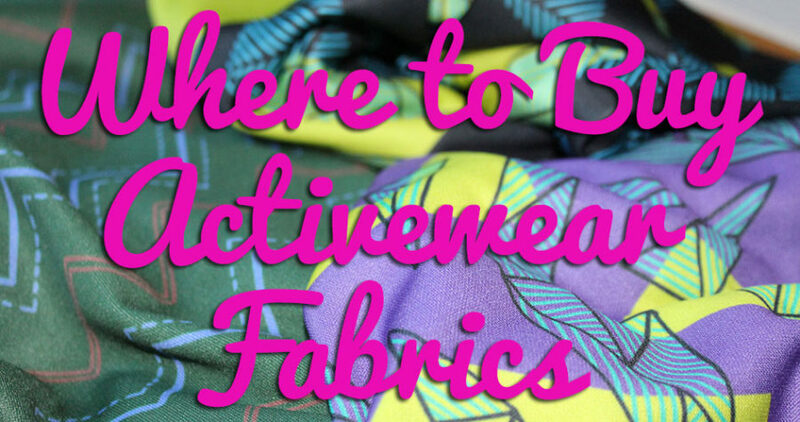 Thank you for the post describing fabric and construction ! thank you so much! I’m glad you found the post helpful, too – I ended up having more to say than I thought! I don’t share this tradition but I should! I do have plans to make a dress this year as I am getting my Masters on my birthday. Sounds like a good year to start a new tradition then! Congratulations. Congratulations with this special birthday and this special dress. I really learned a lot from your description. 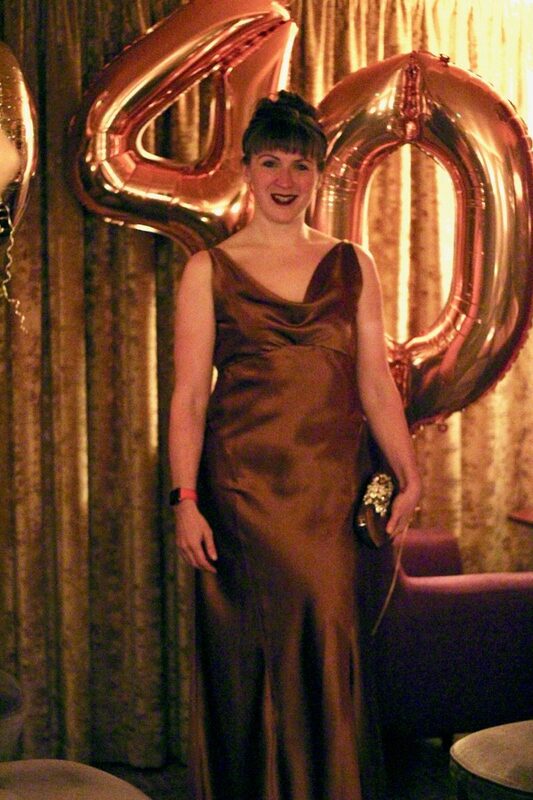 I sewed a lot of party clothes myself, including my own wedding suit, but I never dared to wear an evening dress. 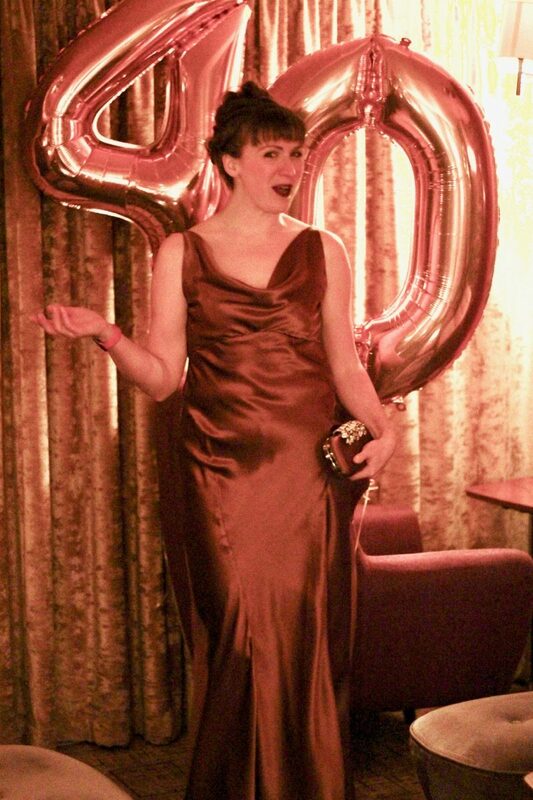 I think the first post of yours I read was your green 30th Birthday dress! Love your tradition. Happy 40th. Your dress turned out lovely!! You are an amazing woman. Happy Birthday! 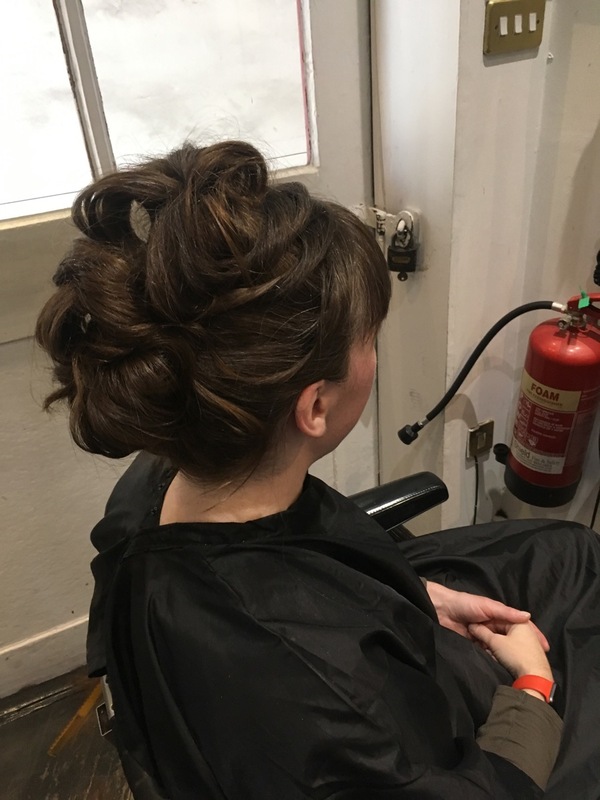 Melissa – you look gorgeous! 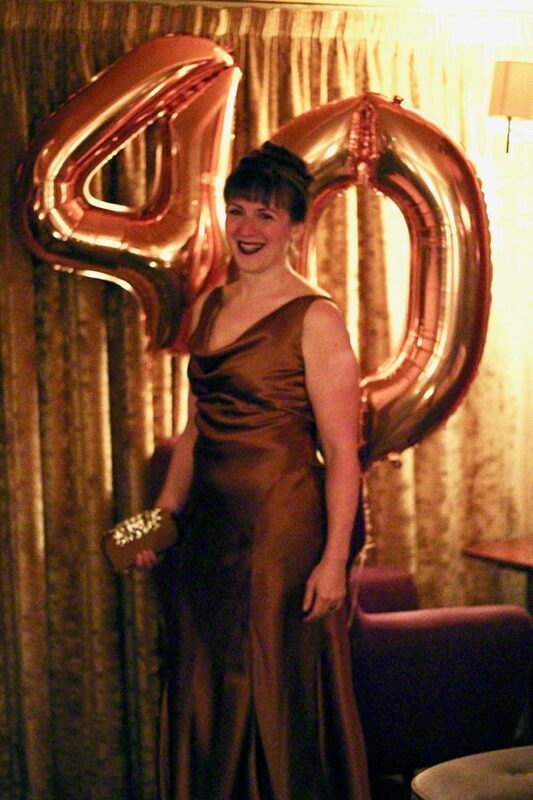 Happy birthday and best to you in your 40s. What a cool idea! Loved looking at your past years’ pattern choices! thanks! Yes, I enjoy looking back through the years so see how things have changed too! Happy Birthday. Love your dress. Happy Birthday! 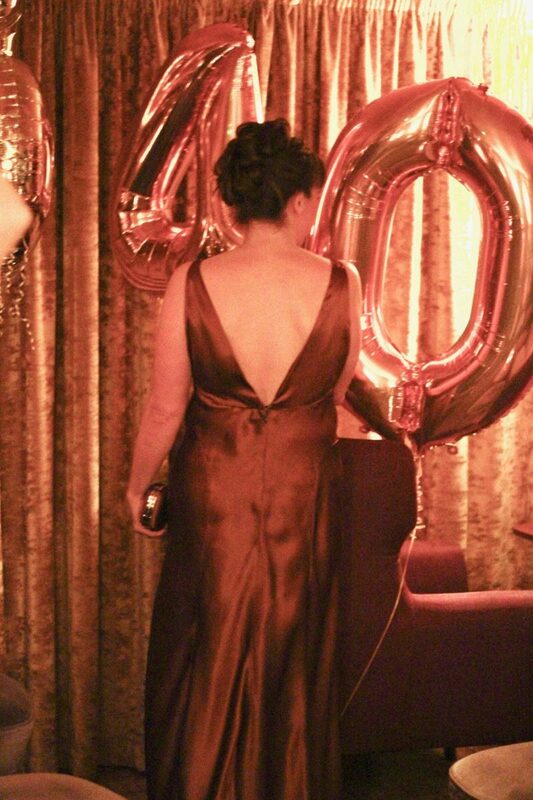 I love how the gorgeous dress coordinates so well with the birthday balloons! thank you! The coordination was just a happy coincidence!